We've teamed up with Nikon to give you a chance to win one of two Nikon 1 J1s equipped with a 10-30mm lens. The Nikon J1 is the UK's best-selling compact system camera following its launch in 2011 and combines a super-small and lightweight body with simple functionality. Featuring ground-breaking shooting modes, high-speed continuous shooting and a super high-speed AF CMOS sensor, the J1 brings new levels of speed, simplicity and enjoyment to the way you capture your world. Visit the Nikon website for more information about products, or sign up to the Nikon newsletter here. 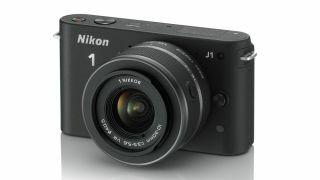 Read our Nikon 1 J1 review for more insight. All you need to do to be in with a chance of winning one of these great cameras is to answer the simple question below. This competition is now closed. The winners are D Weinhold and D Broatch.